Retro Friday is a weekly meme hosted here at Angieville and focuses on reviewing books from the past. This can be an old favorite, an under-the-radar book you think deserves more attention, something woefully out of print, etc. Everyone is welcome to join in at any time! Okay, all you lovers of Grave Mercy. Listen up. I think this book is for you. I first read The Canterbury Papers about six years ago, though it was originally published back in 2003. This is Judith Koll Healey's first novel, though she was a previously published poet and author of short fiction. It was the cover that caught my eye in the bookstore. When I picked it up and read that it took place during the 12th century and involved the crafty Eleanor of Aquintaine and the Knights Templar, I knew I would be reading it. But when it had to go and have one of those sink-your-fingers-in matte covers, I just went ahead and purchased it on the spot. Behold my susceptibility to pretty, tactile covers, for it is great. 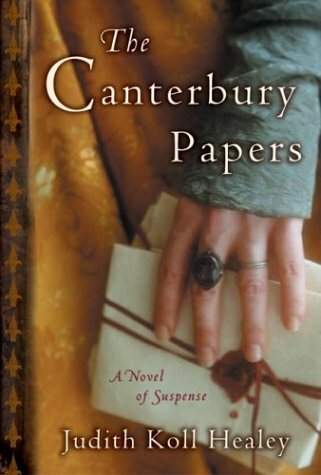 I love anything to do with the Plantagenets, and this one piqued my curiosity double because it is set after much of the traditional drama. It helps that the protagonist is a real-life "forgotten princess" and that Ms. Healey gets to play around with the historical possibilities inherent in her choice of character. I have always loved historical fiction, and I find myself returning to it again and again when I'm in need of some good mental engagement and a visit with figures I've studied and been fascinated by for years. Princess Alais Capet of France thought the nightmare was over. When her long-standing betrothal to Richard the Lionheart was abruptly severed by his ever-scheming mother Eleanor of Aquitaine, Alais was devastated and bewildered. Now a middle-aged spinster, she has grown used to living alone at her brother's court, to the idea that she will never marry. Then an unexpected missive arrives from Eleanor. It includes an imperious demand from the imprisoned queen. Alais is to retrieve Eleanor's letters to Thomas Becket from their hiding place in the Canterbury Cathedral. She is to deliver them to Eleanor before they are discovered and threaten the throne of England itself. In exchange, Eleanor promises to divulge certain information about a family member Alais thought long gone. Unable to ignore the potential goldmine, Alais embarks on the dangerous quest and stumbles across a string of murders, the devious King John, as well as the famed Knights Templar on a mission of their own. Caught up once again in the endless machinations of the Plantagenet family, Alais risks abduction and death to find what she once lost and discover if her future will be one worth living after all. It's wonderful to read about such a mature character. As a girl, Alais became a pawn in a much larger game of thrones. In the intervening years, she retreated from the pain of the past into a numbing and solitary life. When the larger-than-life Plantagenets attempt to use her as a pawn in their game once more, they are all somewhat surprised to find she has grown up in the intervening years, and she will not be the docile girl they knew. I became thoroughly enamored with Alais very shortly into this absorbing novel. The hand she was initially dealt played out very poorly. She's reached a stage in her life where she believes this is as good as it gets. But her response to one last adventure is such a rewarding one. I was equally caught up in the overarching mystery itself and in Alais' personal path toward fulfillment and revival. Healey's treatment of the period and her filling in of the gaps where Alais Capet is concerned is excellent. The writing is even and smooth, the characterization subtle and full of depth. To the outward eye, Alais is taciturn and reserved. But to the privileged reader, she is a keen and wry observer of the misalliances and foibles of each of the royals swirling around her. She is so easy to sympathize with, and it is her compelling blend of vulnerability and steel that kept me at her side for the duration. It is also what earns her the loyalty of a certain character who proves integral to the conclusion of the mystery and Alais' personal journey. There is a lovely, quiet romance here between mature adults. And I sat back and just let myself enjoy the way Healey leisurely wove it into the story. All in all, an intelligent and engrossing read about one of my favorite historical periods and one I have enjoyed returning to for its richness and its winsome protagonist. This sounds amazing. You know how much I love stories with Eleanor of Aquitaine in them! I do! It's quietly lovely. This is that. It reminded me of Grave Mercy in spirit, minus the paranormal aspects, naturally. I putting it on my list! I've had a Eleanor of Aquintaine/Plantagenets love affair ever since I read A Proud Taste of Scarlet and Miniver by the divine E.L. Konigsburg. Interesting. I loved Grave Mercy and thus might need to pick this one up. Livi, might need to! The characters are much more mature and the period is absolutely fascinating. I haven't read Grave Mercy (yet!) 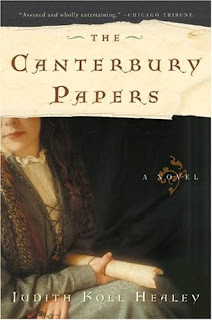 but I have it and Canterbury in my TBR pile. I'm not feeling very "historical" at the moment, but I'll remember this review when I do feel like it. Sounds like I must get to it a.s.a.p! Kay, ooh. You're all set up then. What a charming recommendation! :) I haven't read this one, but I really think I should after reading your recommend/dedication. Thanks! Becky, oh, yes. I think you would enjoy it for sure! I bought this book when it first came out. Haven't ever actually read it though, despite the fact that I do love reading about all things Eleanor of Aquitaine! Marg, wow. Well, it will be there when you're in the mood. I love that. Where has this book been all my life? Damn it Angie, my TBR will never ever ever decrease as long as you keep reading underrated books and recommending them because I will ALWAYS add your recs to my TBR pile, especially when they are compared to Grave Mercy, have Eleanor of Aquitaine, and you invoke the phrase 'game of thrones' in your review. Sigh. April, languishing on under-the-radar bookshelves apparently. I loved it. It's quiet, but wonderful. Hehe. I was hoping those three elements would gel for some readers . . . This sounds lovely, Angie! I never would have found out about this book if not for review, which is why I love your Retro Friday meme. You keep introducing new-to-me, under-the-radar titles. Chach, I'm happy to bring it to someone else's attention. So glad RF is useful. This is the COOLEST meme! I love it! Retro- just the whole concept- it's just so much fun.